"Hilbert" redirects here. For other uses, see Hilbert (disambiguation). David Hilbert (/ˈhɪlbərt/; German: [ˈdaːvɪt ˈhɪlbɐt]; 23 January 1862 – 14 February 1943) was a German mathematician and one of the most influential and universal mathematicians of the 19th and early 20th centuries. Hilbert discovered and developed a broad range of fundamental ideas in many areas, including invariant theory, calculus of variations, commutative algebra, algebraic number theory, the foundations of geometry, spectral theory of operators and its application to integral equations, mathematical physics, and foundations of mathematics (particularly proof theory). Hilbert adopted and warmly defended Georg Cantor's set theory and transfinite numbers. A famous example of his leadership in mathematics is his 1900 presentation of a collection of problems that set the course for much of the mathematical research of the 20th century. Hilbert and his students contributed significantly to establishing rigor and developed important tools used in modern mathematical physics. Hilbert is known as one of the founders of proof theory and mathematical logic, as well as for being among the first to distinguish between mathematics and metamathematics. Hilbert, the first of two children of Otto and Maria Therese (Erdtmann) Hilbert, was born in the Province of Prussia, Kingdom of Prussia, either in Königsberg (according to Hilbert's own statement) or in Wehlau (known since 1946 as Znamensk) near Königsberg where his father worked at the time of his birth. In late 1872, Hilbert entered the Friedrichskolleg Gymnasium (Collegium fridericianum, the same school that Immanuel Kant had attended 140 years before); but, after an unhappy period, he transferred to (late 1879) and graduated from (early 1880) the more science-oriented Wilhelm Gymnasium. Upon graduation, in autumn 1880, Hilbert enrolled at the University of Königsberg, the "Albertina". In early 1882, Hermann Minkowski (two years younger than Hilbert and also a native of Königsberg but had gone to Berlin for three semesters), returned to Königsberg and entered the university. Hilbert developed a lifelong friendship with the shy, gifted Minkowski. In 1884, Adolf Hurwitz arrived from Göttingen as an Extraordinarius (i.e., an associate professor). An intense and fruitful scientific exchange among the three began, and Minkowski and Hilbert especially would exercise a reciprocal influence over each other at various times in their scientific careers. Hilbert obtained his doctorate in 1885, with a dissertation, written under Ferdinand von Lindemann, titled Über invariante Eigenschaften spezieller binärer Formen, insbesondere der Kugelfunktionen ("On the invariant properties of special binary forms, in particular the spherical harmonic functions"). Hilbert remained at the University of Königsberg as a Privatdozent (senior lecturer) from 1886 to 1895. In 1895, as a result of intervention on his behalf by Felix Klein, he obtained the position of Professor of Mathematics at the University of Göttingen. During the Klein and Hilbert years, Göttingen became the preeminent institution in the mathematical world. He remained there for the rest of his life. The Mathematical Institute in Göttingen. Its new building, constructed with funds from the Rockefeller Foundation, was opened by Hilbert and Courant in 1930. Portrait of David Hilbert in the 1900s, artist Anna Gorban, the cover image of the theme issue ‘Hilbert's sixth problem, Phil. Trans. R. Soc. A 2018, 376 (2118). Among Hilbert's students were Hermann Weyl, chess champion Emanuel Lasker, Ernst Zermelo, and Carl Gustav Hempel. John von Neumann was his assistant. At the University of Göttingen, Hilbert was surrounded by a social circle of some of the most important mathematicians of the 20th century, such as Emmy Noether and Alonzo Church. Among his 69 Ph.D. students in Göttingen were many who later became famous mathematicians, including (with date of thesis): Otto Blumenthal (1898), Felix Bernstein (1901), Hermann Weyl (1908), Richard Courant (1910), Erich Hecke (1910), Hugo Steinhaus (1911), and Wilhelm Ackermann (1925). Between 1902 and 1939 Hilbert was editor of the Mathematische Annalen, the leading mathematical journal of the time. "Good, he did not have enough imagination to become a mathematician". —  Hilbert's response upon hearing that one of his students had dropped out to study poetry. Around 1925, Hilbert developed pernicious anemia, a then-untreatable vitamin deficiency whose primary symptom is exhaustion; his assistant Eugene Wigner described him as subject to "enormous fatigue" and how he "seemed quite old", and that even after eventually being diagnosed and treated, he "was hardly a scientist after 1925, and certainly not a Hilbert." Hilbert lived to see the Nazis purge many of the prominent faculty members at University of Göttingen in 1933. 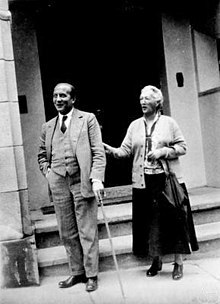 Those forced out included Hermann Weyl (who had taken Hilbert's chair when he retired in 1930), Emmy Noether and Edmund Landau. One who had to leave Germany, Paul Bernays, had collaborated with Hilbert in mathematical logic, and co-authored with him the important book Grundlagen der Mathematik (which eventually appeared in two volumes, in 1934 and 1939). This was a sequel to the Hilbert-Ackermann book Principles of Mathematical Logic from 1928. Hermann Weyl's successor was Helmut Hasse. About a year later, Hilbert attended a banquet and was seated next to the new Minister of Education, Bernhard Rust. Rust asked whether "the Mathematical Institute really suffered so much because of the departure of the Jews". Hilbert replied, "Suffered? It doesn't exist any longer, does it!" By the time Hilbert died in 1943, the Nazis had nearly completely restaffed the university, as many of the former faculty had either been Jewish or married to Jews. 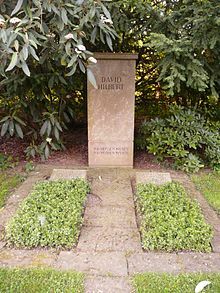 Hilbert's funeral was attended by fewer than a dozen people, only two of whom were fellow academics, among them Arnold Sommerfeld, a theoretical physicist and also a native of Königsberg. News of his death only became known to the wider world six months after he had died. The day before Hilbert pronounced these phrases at the 1930 annual meeting of the Society of German Scientists and Physicians, Kurt Gödel—in a round table discussion during the Conference on Epistemology held jointly with the Society meetings—tentatively announced the first expression of his incompleteness theorem. Gödel's incompleteness theorems show that even elementary axiomatic systems such as Peano arithmetic are either self-contradicting or contain logical propositions that are impossible to prove or disprove. In 1892, Hilbert married Käthe Jerosch (1864–1945), "the daughter of a Königsberg merchant, an outspoken young lady with an independence of mind that matched his own". While at Königsberg they had their one child, Franz Hilbert (1893–1969). Hilbert's son Franz suffered throughout his life from an undiagnosed mental illness. His inferior intellect was a terrible disappointment to his father and this misfortune was a matter of distress to the mathematicians and students at Göttingen. Hilbert considered the mathematician Hermann Minkowski to be his "best and truest friend". Hilbert was baptized and raised a Calvinist in the Prussian Evangelical Church. He later on left the Church and became an agnostic. He also argued that mathematical truth was independent of the existence of God or other a priori assumptions. Hilbert's first work on invariant functions led him to the demonstration in 1888 of his famous finiteness theorem. Twenty years earlier, Paul Gordan had demonstrated the theorem of the finiteness of generators for binary forms using a complex computational approach. Attempts to generalize his method to functions with more than two variables failed because of the enormous difficulty of the calculations involved. In order to solve what had become known in some circles as Gordan's Problem, Hilbert realized that it was necessary to take a completely different path. As a result, he demonstrated Hilbert's basis theorem, showing the existence of a finite set of generators, for the invariants of quantics in any number of variables, but in an abstract form. That is, while demonstrating the existence of such a set, it was not a constructive proof — it did not display "an object" — but rather, it was an existence proof and relied on use of the law of excluded middle in an infinite extension. Das ist nicht Mathematik. Das ist Theologie. I have convinced myself that even theology has its merits. Taking the Principle of the Excluded Middle from the mathematician ... is the same as ... prohibiting the boxer the use of his fists. The text Grundlagen der Geometrie (tr. : Foundations of Geometry) published by Hilbert in 1899 proposes a formal set, called Hilbert's axioms, substituting for the traditional axioms of Euclid. They avoid weaknesses identified in those of Euclid, whose works at the time were still used textbook-fashion. It is difficult to specify the axioms used by Hilbert without referring to the publication history of the Grundlagen since Hilbert changed and modified them several times. The original monograph was quickly followed by a French translation, in which Hilbert added V.2, the Completeness Axiom. An English translation, authorized by Hilbert, was made by E.J. Townsend and copyrighted in 1902. This translation incorporated the changes made in the French translation and so is considered to be a translation of the 2nd edition. Hilbert continued to make changes in the text and several editions appeared in German. The 7th edition was the last to appear in Hilbert's lifetime. New editions followed the 7th, but the main text was essentially not revised. Hilbert's approach signaled the shift to the modern axiomatic method. In this, Hilbert was anticipated by Moritz Pasch's work from 1882. Axioms are not taken as self-evident truths. Geometry may treat things, about which we have powerful intuitions, but it is not necessary to assign any explicit meaning to the undefined concepts. The elements, such as point, line, plane, and others, could be substituted, as Hilbert is reported to have said to Schoenflies and Kötter, by tables, chairs, glasses of beer and other such objects. It is their defined relationships that are discussed. Hilbert first enumerates the undefined concepts: point, line, plane, lying on (a relation between points and lines, points and planes, and lines and planes), betweenness, congruence of pairs of points (line segments), and congruence of angles. The axioms unify both the plane geometry and solid geometry of Euclid in a single system. Hilbert put forth a most influential list of 23 unsolved problems at the International Congress of Mathematicians in Paris in 1900. This is generally reckoned as the most successful and deeply considered compilation of open problems ever to be produced by an individual mathematician. He presented fewer than half the problems at the Congress, which were published in the acts of the Congress. In a subsequent publication, he extended the panorama, and arrived at the formulation of the now-canonical 23 Problems of Hilbert. See also Hilbert's twenty-fourth problem. The full text is important, since the exegesis of the questions still can be a matter of inevitable debate, whenever it is asked how many have been solved. In an account that had become standard by the mid-century, Hilbert's problem set was also a kind of manifesto, that opened the way for the development of the formalist school, one of three major schools of mathematics of the 20th century. According to the formalist, mathematics is manipulation of symbols according to agreed upon formal rules. It is therefore an autonomous activity of thought. There is, however, room to doubt whether Hilbert's own views were simplistically formalist in this sense. that some such axiom system is provably consistent through some means such as the epsilon calculus. We are not speaking here of arbitrariness in any sense. Mathematics is not like a game whose tasks are determined by arbitrarily stipulated rules. Rather, it is a conceptual system possessing internal necessity that can only be so and by no means otherwise. Hilbert published his views on the foundations of mathematics in the 2-volume work Grundlagen der Mathematik. Hilbert and the mathematicians who worked with him in his enterprise were committed to the project. His attempt to support axiomatized mathematics with definitive principles, which could banish theoretical uncertainties, ended in failure. Nevertheless, the subsequent achievements of proof theory at the very least clarified consistency as it relates to theories of central concern to mathematicians. Hilbert's work had started logic on this course of clarification; the need to understand Gödel's work then led to the development of recursion theory and then mathematical logic as an autonomous discipline in the 1930s. The basis for later theoretical computer science, in the work of Alonzo Church and Alan Turing, also grew directly out of this 'debate'. Around 1909, Hilbert dedicated himself to the study of differential and integral equations; his work had direct consequences for important parts of modern functional analysis. In order to carry out these studies, Hilbert introduced the concept of an infinite dimensional Euclidean space, later called Hilbert space. His work in this part of analysis provided the basis for important contributions to the mathematics of physics in the next two decades, though from an unanticipated direction. Later on, Stefan Banach amplified the concept, defining Banach spaces. Hilbert spaces are an important class of objects in the area of functional analysis, particularly of the spectral theory of self-adjoint linear operators, that grew up around it during the 20th century. In 1912, three years after his friend's death, Hilbert turned his focus to the subject almost exclusively. He arranged to have a "physics tutor" for himself. He started studying kinetic gas theory and moved on to elementary radiation theory and the molecular theory of matter. Even after the war started in 1914, he continued seminars and classes where the works of Albert Einstein and others were followed closely. By 1907 Einstein had framed the fundamentals of the theory of gravity, but then struggled for nearly 8 years with a confounding problem of putting the theory into final form. By early summer 1915, Hilbert's interest in physics had focused on general relativity, and he invited Einstein to Göttingen to deliver a week of lectures on the subject. Einstein received an enthusiastic reception at Göttingen. Over the summer Einstein learned that Hilbert was also working on the field equations and redoubled his own efforts. During November 1915 Einstein published several papers culminating in "The Field Equations of Gravitation" (see Einstein field equations). Nearly simultaneously David Hilbert published "The Foundations of Physics", an axiomatic derivation of the field equations (see Einstein–Hilbert action). Hilbert fully credited Einstein as the originator of the theory, and no public priority dispute concerning the field equations ever arose between the two men during their lives. See more at priority. Additionally, Hilbert's work anticipated and assisted several advances in the mathematical formulation of quantum mechanics. His work was a key aspect of Hermann Weyl and John von Neumann's work on the mathematical equivalence of Werner Heisenberg's matrix mechanics and Erwin Schrödinger's wave equation and his namesake Hilbert space plays an important part in quantum theory. In 1926 von Neumann showed that if atomic states were understood as vectors in Hilbert space, then they would correspond with both Schrödinger's wave function theory and Heisenberg's matrices. Throughout this immersion in physics, Hilbert worked on putting rigor into the mathematics of physics. While highly dependent on higher mathematics, physicists tended to be "sloppy" with it. To a "pure" mathematician like Hilbert, this was both "ugly" and difficult to understand. As he began to understand physics and how physicists were using mathematics, he developed a coherent mathematical theory for what he found, most importantly in the area of integral equations. When his colleague Richard Courant wrote the now classic Methoden der mathematischen Physik (Methods of Mathematical Physics) including some of Hilbert's ideas, he added Hilbert's name as author even though Hilbert had not directly contributed to the writing. Hilbert said "Physics is too hard for physicists", implying that the necessary mathematics was generally beyond them; the Courant-Hilbert book made it easier for them. Hilbert unified the field of algebraic number theory with his 1897 treatise Zahlbericht (literally "report on numbers"). He also resolved a significant number-theory problem formulated by Waring in 1770. As with the finiteness theorem, he used an existence proof that shows there must be solutions for the problem rather than providing a mechanism to produce the answers. He then had little more to publish on the subject; but the emergence of Hilbert modular forms in the dissertation of a student means his name is further attached to a major area. He made a series of conjectures on class field theory. The concepts were highly influential, and his own contribution lives on in the names of the Hilbert class field and of the Hilbert symbol of local class field theory. Results were mostly proved by 1930, after work by Teiji Takagi. Hilbert did not work in the central areas of analytic number theory, but his name has become known for the Hilbert–Pólya conjecture, for reasons that are anecdotal. His collected works (Gesammelte Abhandlungen) have been published several times. The original versions of his papers contained "many technical errors of varying degree"; when the collection was first published, the errors were corrected and it was found that this could be done without major changes in the statements of the theorems, with one exception—a claimed proof of the continuum hypothesis. The errors were nonetheless so numerous and significant that it took Olga Taussky-Todd three years to make the corrections. ^ Weyl, H. (1944). "David Hilbert. 1862-1943". Obituary Notices of Fellows of the Royal Society. 4 (13): 547–553. doi:10.1098/rsbm.1944.0006. ^ Richard Zach, "Hilbert's Program", The Stanford Encyclopedia of Philosophy. ^ "Hilbert". Random House Webster's Unabridged Dictionary. ^ Zach, Richard (2003-07-31). "Hilbert's Program". Stanford Encyclopedia of Philosophy. Retrieved 2009-03-23. ^ Reid 1996, pp. 1–2; also on p. 8, Reid notes that there is some ambiguity as to exactly where Hilbert was born. Hilbert himself stated that he was born in Königsberg. ^ Reid 1996, pp. 4–7. ^ Reid 1996, p. 11. ^ Reid 1996, p. 12. ^ "The Mathematics Genealogy Project - David Hilbert". Retrieved 2007-07-07. ^ David J. Darling (2004). The Universal Book of Mathematics. John Wiley and Sons. p. 151. ISBN 978-0-471-27047-8. ^ Eckart Menzler-Trott: Gentzens Problem. Mathematische Logik im nationalsozialistischen Deutschland., Birkhäuser, 2001, ISBN 3-764-36574-9, Birkhäuser; Auflage: 2001 p. 142. ^ Hajo G. Meyer: Tragisches Schicksal. Das deutsche Judentum und die Wirkung historischer Kräfte: Eine Übung in angewandter Geschichtsphilosophie, Frank & Timme, 2008, ISBN 3-865-96174-6, p. 202. ^ Reid 1996, p. 213. ^ "The Conference on Epistemology of the Exact Sciences ran for three days, from 5 to 7 September" (Dawson 1997:68). "It ... was held in conjunction with and just before the ninety-first annual meeting of the Society of German Scientists and Physicians ... and the sixth Assembly of German Physicists and Mathematicians.... Gödel's contributed talk took place on Saturday, 6 September , from 3 until 3:20 in the afternoon, and on Sunday the meeting concluded with a round table discussion of the first day's addresses. During the latter event, without warning and almost offhandedly, Gödel quietly announced that "one can even give examples of propositions (and in fact of those of the type of Goldbach or Fermat) that, while contentually true, are unprovable in the formal system of classical mathematics " (Dawson:69) "... As it happened, Hilbert himself was present at Königsberg, though apparently not at the Conference on Epistemology. The day after the roundtable discussion he delivered the opening address before the Society of German Scientists and Physicians -- his famous lecture Naturerkennen und Logik (Logic and the knowledge of nature), at the end of which he declared: 'For the mathematician there is no Ignorabimus, and, in my opinion, not at all for natural science either. ... The true reason why [no one] has succeeded in finding an unsolvable problem is, in my opinion, that there is no unsolvable problem. In contrast to the foolish Ignorabimus, our credo avers: We must know, We shall know '"(Dawson:71). Gödel's paper was received on November 17, 1930 (cf Reid p. 197, van Heijenoort 1976:592) and published on 25 March 1931 (Dawson 1997:74). But Gödel had given a talk about it beforehand... "An abstract had been presented on October 1930 to the Vienna Academy of Sciences by Hans Hahn" (van Heijenoort:592); this abstract and the full paper both appear in van Heijenoort:583ff. ^ Reid 1996, p. 36. ^ Reid 1996, p. 139. ^ Reid 1996, p. 121. In the 1927 Hamburg address, Hilbert asserted: "mathematics is pre-suppositionless science (die Mathematik ist eine voraussetzungslose Wissenschaft)" and "to found it I do not need a good God ([z]u ihrer Begründung brauche ich weder den lieben Gott)" (1928, S. 85; van Heijenoort, 1967, p. 479). However, from Mathematische Probleme (1900) to Naturerkennen und Logik (1930) he placed his quasi-religious faith in the human spirit and in the power of pure thought with its beloved child– mathematics. He was deeply convinced that every mathematical problem could be solved by pure reason: in both mathematics and any part of natural science (through mathematics) there was "no ignorabimus" (Hilbert, 1900, S. 262; 1930, S. 963; Ewald, 1996, pp. 1102, 1165). That is why finding an inner absolute grounding for mathematics turned into Hilbert’s life-work. He never gave up this position, and it is symbolic that his words "wir müssen wissen, wir werden wissen" ("we must know, we shall know") from his 1930 Königsberg address were engraved on his tombstone. Here, we meet a ghost of departed theology (to modify George Berkeley’s words), for to absolutize human cognition means to identify it tacitly with a divine one. ^ "Mathematics is a presuppositionless science. To found it I do not need God, as does Kronecker, or the assumption of a special faculty of our understanding attuned to the principle of mathematical induction, as does Poincaré, or the primal intuition of Brouwer, or, finally, as do Russell and Whitehead, axioms of infinity, reducibility, or completeness, which in fact are actual, contentual assumptions that cannot be compensated for by consistency proofs." David Hilbert, Die Grundlagen der Mathematik, Hilbert's program, 22C:096, University of Iowa. ^ Michael R. Matthews (2009). Science, Worldviews and Education. Springer. p. 129. ISBN 9789048127795. As is well known, Hilbert rejected Leopold Kronecker's God for the solution of the problem of the foundations of mathematics. ^ Constance Reid 1996, pp. 36–37. ^ Reid 1996, p. 34. ^ a b Reid 1996, p. 37. ^ cf. Reid 1996, pp. 148–149. ^ Reid 1996, p. 148. ^ Reid 1996, p. 150. ^ Hilbert, D. (1919-20), Natur und Mathematisches Erkennen: Vorlesungen, gehalten 1919-1920 in G\"ottingen. Nach der Ausarbeitung von Paul Bernays (Edited and with an English introduction by David E. Rowe), Basel, Birkh\"auser (1992). ^ Reid 1996, p. 129. ^ Since 1971 there have been some spirited and scholarly discussions about which of the two men first presented the now accepted form of the field equations. "Hilbert freely admitted, and frequently stated in lectures, that the great idea was Einstein's. "Every boy in the streets of Gottingen understands more about four dimensional geometry than Einstein," he once remarked. "Yet, in spite of that, Einstein did the work and not the mathematicians" (Reid 1996, pp. 141–142, also Isaacson 2007:222 quoting Thorne p. 119). ^ In 1926, the year after the matrix mechanics formulation of quantum theory by Max Born and Werner Heisenberg, the mathematician John von Neumann became an assistant to David Hilbert at Göttingen. When von Neumann left in 1932, von Neumann's book on the mathematical foundations of quantum mechanics, based on Hilbert's mathematics, was published under the title Mathematische Grundlagen der Quantenmechanik. See: Norman Macrae, John von Neumann: The Scientific Genius Who Pioneered the Modern Computer, Game Theory, Nuclear Deterrence, and Much More (Reprinted by the American Mathematical Society, 1999) and Reid 1996. ^ This work established Takagi as Japan's first mathematician of international stature. ^ Page 284f in: Wilfried Sieg (2013). Hilbert's Programs and Beyond. Oxford University Press. ISBN 9780195372229. ^ a b Rota G.-C. (1997), "Ten lessons I wish I had been taught", Notices of the AMS, 44: 22-25. Ewald, William B., ed. (1996). From Kant to Hilbert: A Source Book in the Foundations of Mathematics. Oxford, UK: Oxford University Press. 1922. "The new grounding of mathematics: First report," 1115–1133. 1923. "The logical foundations of mathematics," 1134–1147. 1930. "Logic and the knowledge of nature," 1157–1165. 1931. "The grounding of elementary number theory," 1148–1156. 1904. "On the foundations of logic and arithmetic," 129–138. 1925. "On the infinite," 367–392. 1927. "The foundations of mathematics," with comment by Weyl and Appendix by Bernays, 464–489. van Heijenoort, Jean (1967). From Frege to Gödel: A source book in mathematical logic, 1879–1931. Harvard University Press. Hilbert, David (1950) . The Foundations of Geometry [Grundlagen der Geometrie] (PDF). Translated by Townsend, E.J. (2nd ed.). La Salle, IL: Open Court Publishing. Hilbert, David; Cohn-Vossen, Stephan (1999). Geometry and Imagination. American Mathematical Society. ISBN 978-0-8218-1998-2. An accessible set of lectures originally for the citizens of Göttingen. Hilbert, David (2004). Hallett, Michael; Majer, Ulrich (eds.). David Hilbert's Lectures on the Foundations of Mathematics and Physics, 1891–1933. Berlin & Heidelberg: Springer-Verlag. ISBN 978-3-540-64373-9. Bertrand, Gabriel (20 December 1943b), "Allocution", Comptes rendus hebdomadaires des séances de l'Académie des sciences (in French), Paris, 217: 625–640 , available at Gallica. The "Address" of Gabriel Bertrand of December 20, 1943 at the French Academy: he gives biographical sketches of the lives of recently deceased members, including Pieter Zeeman, David Hilbert and Georges Giraud. Dawson, John W. Jr 1997. Logical Dilemmas: The Life and Work of Kurt Gödel. Wellesley MA: A. K. Peters. ISBN 1-56881-256-6. Folsing, Albrecht, 1998. Albert Einstein. Penguin. Grattan-Guinness, Ivor, 2000. The Search for Mathematical Roots 1870-1940. Princeton Univ. Press. Mancosu, Paolo (1998). From Brouwer to Hilbert, The Debate on the Foundations of Mathematics in 1920s. Oxford Univ. Press. ISBN 978-0-19-509631-6. Mehra, Jagdish, 1974. Einstein, Hilbert, and the Theory of Gravitation. Reidel. Reid, Constance, 1996. Hilbert, Springer, ISBN 0-387-94674-8. The definitive English-language biography of Hilbert. Rowe, D. E. (1989). "Klein, Hilbert, and the Gottingen Mathematical Tradition". Osiris. 5: 186–213. doi:10.1086/368687. Sauer, Tilman (1999). "The relativity of discovery: Hilbert's first note on the foundations of physics". Arch. Hist. Exact Sci. 53: 529–75. arXiv:physics/9811050. Bibcode:1998physics..11050S. Wikimedia Commons has media related to David Hilbert. O'Connor, John J.; Robertson, Edmund F., "David Hilbert", MacTutor History of Mathematics archive, University of St Andrews .